A View Of Part Of St. Thome Street, Fort St. George. 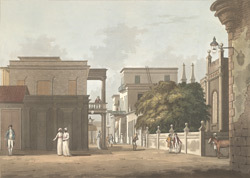 bl.uk > Online Gallery Home	> Online exhibitions	> Asia, Pacific and Africa Collections	> A View Of Part Of St. Thome Street, Fort St. George. Plate three from '24 Views in Indostan by William Orme'. THis aquatint is based on an original composition by Francis Swain Ward (1736-94). It shows St. Thome Street, which ran inside Fort Saint George, in the city of Madras (now known as Chennai). The fort was commenced in 1644 and was gradually converted into a formidable masonry structure. In 1694 the original Fort House was demolished to make way for a new one and in 1711 the inner Fort walls and corner bastions were pulled down and Fort Square was created. The buildings inside Fort Saint George are fine examples of British architecture from the 17th and 18th Centuries.